Earthquake and tsunami victims continue to suffer from devastating effects. Nining was about to start a work shift at a water spinach farm on Indonesia’s Sulawesi island when a 7.5 magnitude earthquake hit. The 25-year-old had picked up some fertiliser and was approaching a field when the effects of the quake erupted around her. The 28 September earthquake devastated her area with rivers of soil. The quake also generated a tsunami that killed at least 2,096 people and seriously injured over 10,000. Across affected parts of Sulawesi shops, homes, mosques and hotels collapsed and were swept away or suffered extensive damage. At least 67,000 houses were damaged or destroyed. Nining was among the luckier ones. She discovered that, though the ground near her house had cracked open and mud overwhelmed her yard, her husband Yulius, 30, and her mother-in-law had taken their two daughters Tiwi, 7, and Tiara, 3, to higher ground. Their home was more or less intact. A crowd of other local people also headed for that section of higher ground, a large field. The field became a place of refuge in the days of chaos that followed the quake, with it soon transforming into an ad hoc camp. However, Nining is among two million survivors who continue to suffer from the earthquake’s devastating effects. More than 87,000 people are living in evacuation centres or informal camps, with many more staying with relatives or friends. Many of her neighbours in the camp have left the field. Nining’s family had to stay longer in the informal camp. One of their children is too traumatised to return home. Their means to make a living are also still in tatters. “I want to go home. My youngest child Tiara is still scared. Whenever we visit home, she always says, ‘let’s go back to our house on the hill,’ referring to this shelter,” she said. Her husband, Yulius, has become the sole breadwinner of the family. Caritas has procured essential food, drinking water and household items for 6,000 families, as well as 9,900 tarpaulins, bedding and distributions are ongoing. It has handed out 2,000 household-and-hygiene kits to affected families. Caritas has helped Nining. “I received a mosquito net, a jerry can, a bucket, toothpaste, toothbrushes, soap, shampoo, detergent, dishwashing soap, and a water pail,” she said. 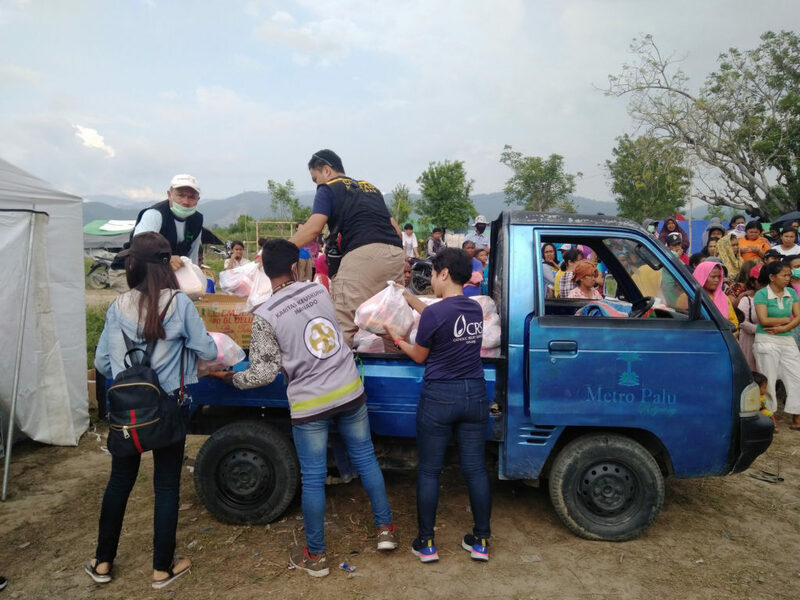 Caritas organisations have distributed essential food and non-food items and tarps to several thousand households affected by the disaster. Caritas hopes to assist 4,500 families (18,000 individuals) in the next 8 months through the direct distribution of supplies or through cash assistance allowing people the flexibility to purchase items of greatest need for their families. Caritas is also providing support for improvement of communities resilience and psycho-social support. Vulnerable individuals in seven communities, including displaced children in camps and schools, will access psychosocial support services or activities.